OLD PARKED CARS. : 1975 Austin Marina. 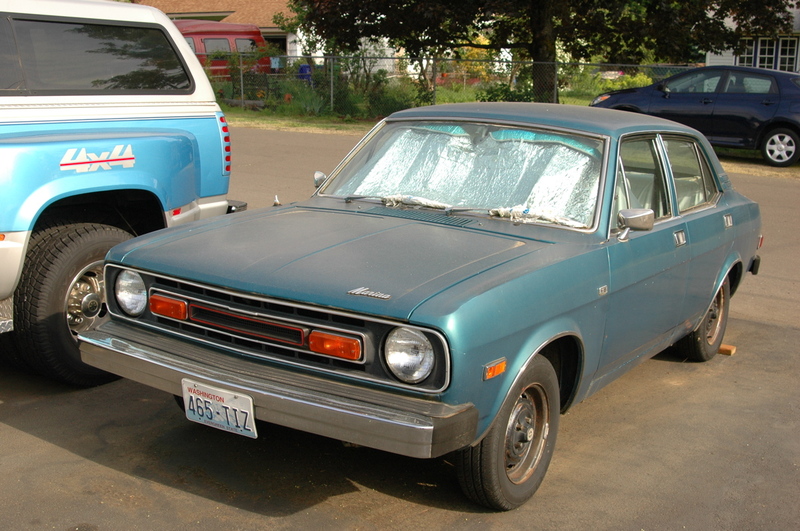 A US MARKET MORRIS MARINA?!?!?!?!?! Best of 2012-that is all. They brought these to the U.S.? I had no clue! Cool. Wow. Awesome. Great find. wow, what an unexpected find in the u.s. it's great to see one out and about. 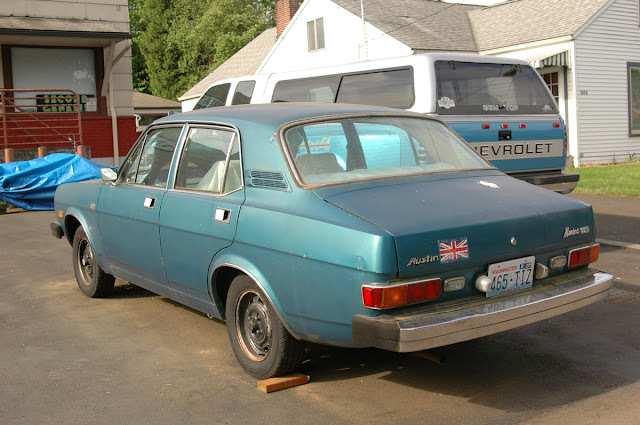 everything about it just screams British Leyland. I would love to see more BL cars around the states they made some cool models and interesting designs. But really exceptional find like the others already noted. My mom bought one as used as those were very cheap, had it 6 years and then it rusted away. Basic transportation and simple mechanics but not very reliable, not so good to drive, noisy and prone to rust. Wow! And I thought the Yugo was a rare find...how do you guys keep coming up with these great spots? Cue the piano being dropped on it. To the Anon above....yup, I bet Clarkson, that prick, would want to destroy this one too. It looks like they imported door handles from American Motors and the grill from Nissan/Datsun! This is crazy. Just crazy. How can one city like Portland have so many old cars in it? It's not physically possible. 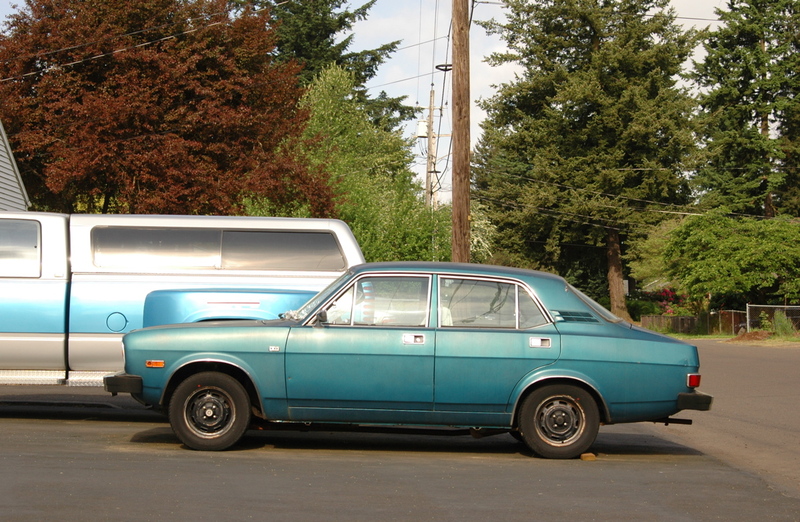 These were imported for only three years, and there are probably only three left--all in Portland, I'm sure. This was a great car--as long as you didn't try to brake or turn or drive it in the rain or leave it outside or own it for more than six months or look at it or sit in it or live with it or be seen in it or...anyway, this is the find of a lifetime (or at least it would be for me, for you guys. it's just another day, another car that 99.99% of America has never seen and never will see). You hit the nail on the head, Professor. I bet there really is only 3-4 left in the US. These terrible cars were marketed to many unfortunate Canadians, I noticed the piece of 2x4 used to keep it from rolling away, standard equipment of the day. Can't be English. Where's the fire extinguisher? Well, this find would certainly make my year. Would I like talking to the owner...yes, I think so. I can't imagine a more delightful color or finish. You best gimme a close-up of them badges! Because no one else will be able to. I like to learn 1 thing a day. The US magazine ads for these were great. Getting a Marina is just like buying a Land Rover or a Jaguar E-Type! No, really! between this and the crazy purple superbird i am absolutely dumbfounded. The feeble little insurance salesmans bonus upgrade that some poetic soul is keeping alive and that clown car with a jungle-gym wing... this site leaves me decidedly boggled. What goes on in the oregonian mind????? You'll see those door handles on many, many cars by numerous manufacturers. As well as the Marina they were used on the Austin Allegro, Range Rover Classic, Triumph TR7, Lotus Esprit, Reliant Scimitar, Landrover Discovery and more. They are often referred to as "The Marina Flap"